Contact the organisation for details of any current professional development opportunities with the Company. everyBODY dance aims to inspire, explore and create great dance experiences with disabled and non-disabled people of all ages in unexpected spaces. A diverse range of projects is available including commissioned work, performance, touring, education, training and recreational workshops. The work aims to bring disabled and non-disabled people together in an inclusive context. Aerial dance projects cater for beginners to professional level learners in both workshops and performances. Community projects bring together a diverse range and infinite number of local people and artists to develop creative ideas around a shared theme resulting in performance. 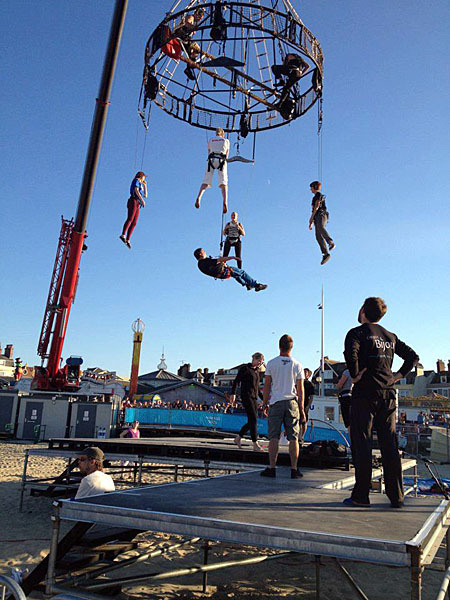 A spectacular 6m high dome rig is used for the aerial work both indoors and out and is available for hire. Rachel Freeman founder of Blue Eyed Soul Dance Company, has been a leading UK exponent of inclusive aerial and community dance for nearly two decades and now leads the work of everyBODY dance.